Our straightening and cutting department is as versatile as it is efficient. We have the technology to straighten wire as fine as .008 inches and as thick as 5/16 of an inch; as long as 240 inches to as short as one inch. Our experienced crew can straighten soft copper, spring tempered stainless steel, or anything in between. Whatever your company's particular straightening and cutting needs are we will meet. 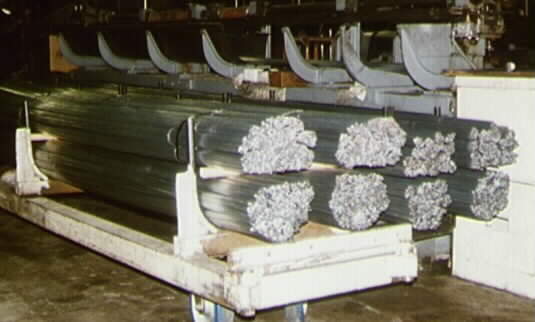 SHOWN: 1/4″galvanized annealed s/c 120″ (4,000#); 1/4″ galvanized annealed s/c 144″ (4,000#); one of PARAMOUNT WIRE CO.'s straightnening and cutting machines.